Opens: When Lila married George Briggs, she believed they would settle into a lovely little house, raise a family, and live happily ever after. She was partly right. Blurb: Aspiring journalist Meghan Briggs has always been the responsible one in the family. So when her father passes away unexpectedly, leaving behind his at-risk business, she steps up to save his legacy—even if that means putting her own dreams on hold. Tracy couldn’t be more different from her sister. She’s always been the rebellious type, without much direction in life. But in the wake of her latest romantic disaster, she finds herself moving back home as a single mother. As both sisters navigate unexpected challenges and exciting new relationships, they’ll find that putting the past to rest can make way for beautiful new beginnings. My thoughts: The thing I enjoy most about ALL of Bette Lee Crosby books are that she writes about ‘real’ people. People whose lives you become part of as you read the book. You can laugh with them, grieve with them, worry about things together and share their joys as well. And even though there are some tough issues dealt with in THE SUMMER OF NEW BEGINNINGS such as death, sacrifice, disability and domestic abuse; these are counter-balanced by love, support, selflessness and laughter. At the start of the story George, dies and leaves a Lila a widow and their two daughters grieving his loss and to pick up the pieces. Meghan, closest to her father, gives up her dreams to take over the family business, however she feels that her father may not be fully gone and is still there guiding her. Tracy rebels without her father’s firm and loving hand and runs off to another state with her boyfriend’ Lila, his wife, has lost her reason for being and is struggling to find out what her role is in life now – she was happiest cooking huge meals – but with only two at home now she is at a loss. Tracy returns home with her baby boy, Lucas, her dreams broken. Her return is the turning point for a family that is merely existing – not living. Lila now has a purpose in life – being a grandmother – and cooking gain. Just after Tracy’s return, Meghan rescues a drowning puppy from the lake when a sudden storm blows up – and so Sox comes into their lives. He plays an important part. Through him they discover that Lucas has a medical problem and Meghan meets the local vet who becomes a love interest. The two sisters start to work together for a common goal, helping Lucas. There are squabbles – come on, they are sisters after all; lessons are learned, chances taken and slowly the story works its magic. By the end, there is the hope that each of the Briggs family will get their happy ever after. 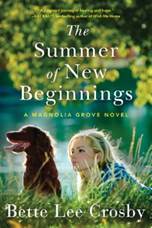 But this is the first of the Magnolia Grove Series so no matter that most of the threads have been tied, there is a ‘wait, there’s more’ for one of the family members. I can hardly wait until October when the next book is released. With thanks to the author for my copy to read and review via Lake Union Publishing and Netgalley.